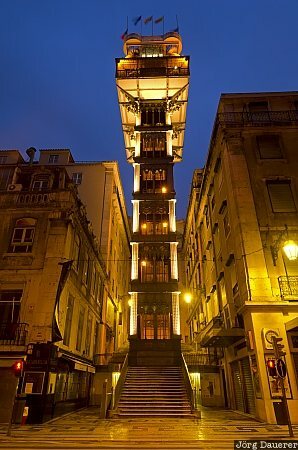 Santa Justa Lift (Elevador de Santa Justa), also called Carmo Lift (Elevador do Carmo) is one of the landmarks of Lisbon. It connects the streets of the central Baixa district with the higher Carmo Square (Largo do Carmo). Lisbon (Lisboa) is the capital of Portugal. This photo was taken in the early morning of a cloudy day in April of 2011. This photo was the image of the month in February of 2013. This photo was taken with a digital camera.